This all-suite hotel in Fernandina Beach features full kitchens in all suites and an outdoor courtyard with a pool. The hotel is a 10-minute drive to Fort Clinch State Park. Welcome to The Residence Inn Amelia Island, the newest suite hotel in beautiful Fernandina Beach, Florida. Located within walking distance of premier Amelia Island beaches, the Residence Inn Amelia Island hotel offers convenience and quality accommodations synonymous with Marriott brand hotels. Traveling to The Residence Inn Amelia Island is easy! Jacksonville International Airport is just 25 miles from the hotel. Amelia Island attractions and activities are minutes from the hotel. For a picture-perfect island vacation on the Atlantic coast of Florida, The Residence Inn Amelia Island hotel offers unbeatable value. Relax in total luxury in your spacious studio, one- or two-bedroom suite at The Residence Inn Amelia Island. Each of our 133 chic accommodations features sophisticated furnishings, a gourmet kitchen with full-size appliances, a housewares package, and free Internet access. 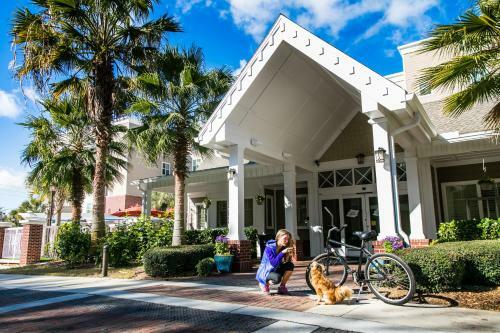 Residence Inn Amelia Island hotel is pet-friendly because you shouldn’t have to leave any member of the family at home. Guests at Residence Inn Amelia Island are treated to a complete and complimentary hot breakfast each day of their vacation. The Residence Inn Amelia Island also hosts social experiences on select evenings. Hotel guests are invited to enjoy tastings from local restaurants, BBQ, Make your own S’Mores, story telling and more. It’s a wonderful way to meet new friends and share reviews of the day’s adventures. Looking for the perfect venue to host your small business meeting, wedding, family or military reunion or banquet on Amelia Island? Residence Inn Amelia Island offers 1,100 square feet of contemporary event space that accommodates up to 118 people. In addition to meeting and event services, Residence Inn Amelia Island hotel offers a fitness center, outdoor swimming pool, walking path, putting green and a host of other value-added amenities. Plan your Fernandina Beach vacation with the help of The Residence Inn Amelia Island. Our hotel Florida vacation packages are built for value and fun. Whether you’re visiting Fernandina Beach with your sweetheart, the kids or the dog, The Residence Inn Amelia Island vacation packages can’t be beat. Reserve online for the best rates and availability.